Roger started working in the hobby industry at the age of 15, starting at Tait's Hobby Shop in 1969. He eventually became a manager there (at the Saginaw mall location), and even worked at the branch that was open in Midland for a few short months. After working for Don Tait for 15 years, Roger and his wife Darlene decided it was time to open their own hobby shop. It was December in 1983 when Roger's Hobby Center first opened its doors. There were six people on staff then, one of whom is still with us today. Business was good, and in 1992, Roger moved the store to a new location, not far away from the old one. This new store was larger than the previous location, and offered the ability to increase our product depth and expand into new categories. We stayed at this location for nearly twenty years. In the fall of 2011, times had gotten tougher in the rough economy, and, with the rise of large chain craft stores, our craft section was just a shadow of its former self. This made it necessary to move the store once again, to a slightly smaller location right next door to the current store. This forced us to consolidate our products and focus on the things we do best. We've always specialized in the radio control aspect of the business (cars, airplanes, helicopters, and boats), but we also supply local hobbyists with plastic models, trains, gaming supplies, dollhouse supplies, coin and stamp materials, hobby tools, slot cars, and art supplies. We have one of the area's best selection of puzzles, combining national brands with local manufacturers. We offer repair services for radio control vehicles as well. We've now been in business for over 35 years, and we continue to serve the Mid-Michigan area for all their hobby needs. We are also branching out, with accounts on social media giants such as Facebook, Twitter, and YouTube. We're looking forward to continuing the tradition we've followed for more than thirty years - providing best-in-class service and support to our customers and promoting the hobbies we hold dear - for years to come! How big is your store? What do you carry? 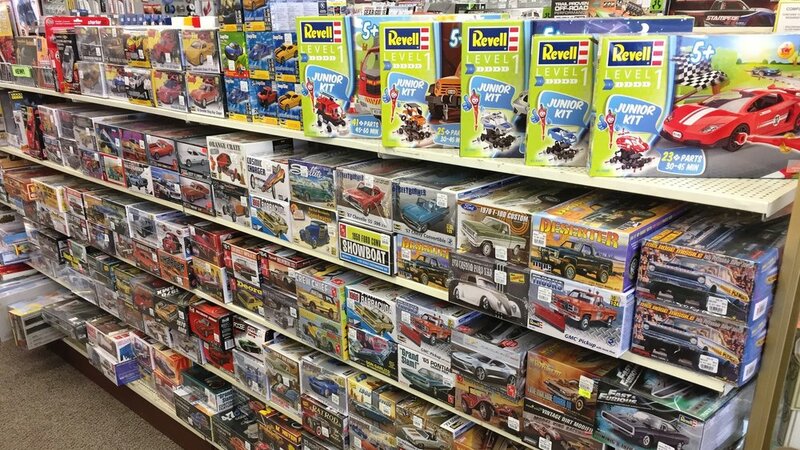 Our store is 3,000 square feet of hobby goodness, including radio controlled cars, trucks, boats, helicopters, airplanes and accessories. 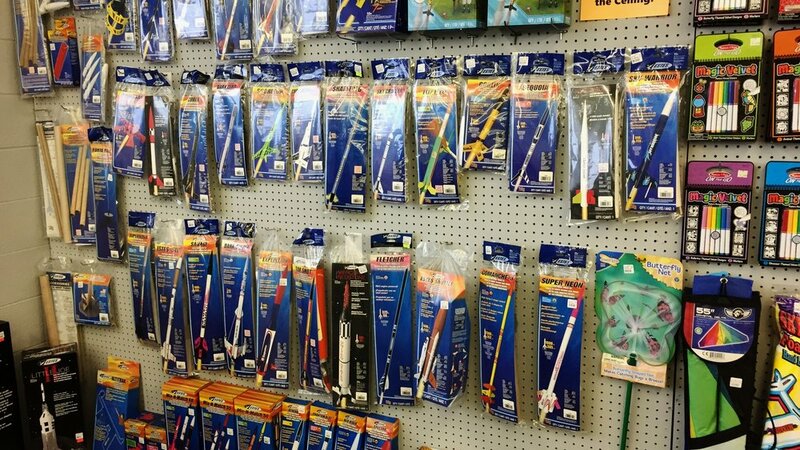 We also carry plastic and wood models, model trains, art supplies, science kits, model rocketry supplies, candles, beanie babies, puzzles, coin and stamp collecting supplies, slot cars, and sundry other items. Didn’t you used to be somewhere else? Yup. We moved back in 2011. Why should I buy from you!? I can find this thing cheaper online! I'm sure you can. But we think shopping with us has value that you just can't get online. Here's some more information on the subject, and why we think you should shop with us! I'd like to write you a check for my purchase. Is that okay? Nope. We don't take checks anymore. We've been burned once too many times on checks. We're happy to accept all major credit cards, debit cards, and, of course, cash. We apologise for the inconvenience, but be mad the dude (who's name escapes me) that took area businesses for more than $100,000 in check fraud, not us. Why don’t you sell or list all your products online? We've thought about it, but we felt we can’t bring anything new to online sales, and if we can't give consumers a compelling reason to buy from us online, we're better off focusing on the things we can do well. As for listing everything on here, it's simply too difficult to list all the items we carry on the website. We are a small store, and we only have one person working on our website. So with nearly 10,000 SKUs in our inventory, it would be pretty much impossible to list them all, especially since some departments, like plastic models and model trains, tend to change on a regular basis. Why don't you carry [insert R/C brand here]? They're the best! We can't carry all the brands in R/C. In fact, there isn't a company on the planet that deals with every R/C brand under the sun. We have to pick and choose what we think are the best of the best that we can get. We determine that based on quality of the products, the quality of customer service, and the overall bang for the buck. We're focused on quality products from quality brands. So we might not carry that awesome R/C truck or helicopter or airplane you found online really cheap, but we probably have something similar — and chances are, you'll be happier with something we carry than with something only available online. Why Don't You Have More R/C Racing Stuff? As the hobby has progressed over the years, we've transitioned out of stocking items that racers want/use/need. Reasons? First, from a business perspective, there aren't enough racers to support a hobby shop, locally speaking. Second, racers' needs are far too varied, whereas most bashers all want the same things (within reason, of course). It's far easier to have the part or upgrade a basher is looking for, and far too difficult to please the racing crowd — not because they are picky, but because no one wants the same two items. This is the same reason we have trouble stocking rock-crawler items — we don't have enough room, money, and demand for any one individual product.